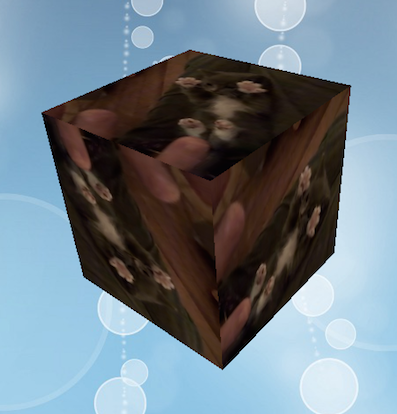 I just added another experimental new feature: support for AIR 17's new "VideoTextures"! Beware that video textures are currently only supported in AIR (not the Flash Player) and only on Windows, OS X and iOS. Furthermore, you'll need AIR 17. Oh, and one more thing: Chris Campbell from Adobe would like to know how urgent you guys need support for VideoTexture in Flash. Do you need it at all? And if yes, what's more important: Android or Flash support? Thanks in advance for that info, as well! We need VideoTextures support on Android firstly. It's very critical because AIR on Android have a lot of bugs and issues. VideoTextures could solve most of them. That is a great addition Daniel, thanks, I will give it a try in a couple of hours. Android first I think it's pretty unanimous. Android is definitely more important. Flash Player would be nice, though, so that it's fully cross-platform. Quick, someone do a video puzzle! +1 for Android, it's very important and FP too. +1 Android and thanks Daniel for this great addition! @Artemix: in this case, an SWF would not have helped, since the feature is AIR-only at the moment! 😉 But an animated GIF would have been an option, I think the forum supports it! This is a very important feature! Great! When to wait a commit? Ah, sorry, I thought you talked about a forum-feature! No, I can't do that in Starling ... at least not as VideoTexture. But you can use a texture atlas and movie clip, of course, if you manually extract the GIF's frames. Unfortunately I need to load GIF from internet. It works, but I would like more optimized and without 1 minute delay at the start. Where can I find this new feature? I've downloaded both github and gamua.com versions but SystemUtil.supportsVideoTextures gives me an error.